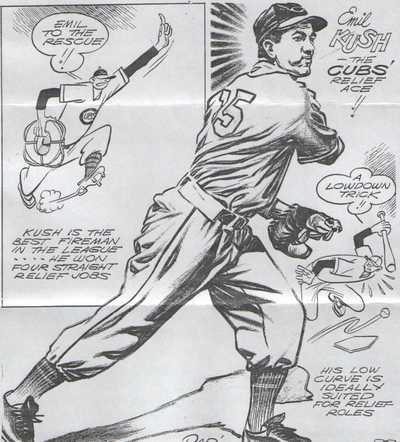 Emil Kush, a boy from Chicago’s northside, who waited nine years to make a boyhood dream come true, was rivaling the Boston Red Sox’ Earl Johnson as the number one relief pitcher in the major leagues today. Emil B Kush was born in Chicago, Illinois on November 4, 1916. The second son of Polish immigrants, Emil grew up playing 16-inch softball on the vacant lot around Thomas Street and Grand Avenue. In 1936, at the age of 19, he attended a public tryout at Wrigley Field, and Cubs’ manager, Charlie Grimm, was reasonably impressed with the young right-hander. Emil was told to “leave his glove and spikes at the ballpark,” and for the rest of the season he was paid $5 a day to pitch batting practice. Late in the season he was sent to the farm team at Toledo, but when he did not appear in a game during the Mud Hens’ road trip to the Twin Cities and Milwaukee, he left the team in frustration. Emil pitched for Ponca City of the Western Association in 1937, compiling a 14-14 record in 36 games. Meanwhile, his younger brother, Ray Kush, earned a job catching batting practice with the Cubs. In 1938, Emil was 17-14 in 41 games for Ponca City. Emil hurled for Los Angeles of the Pacific Coast League in 1939, appearing in 18 games with an 0-1 record. Although Emil lacked control he had a natural sidearm sinker, a pretty good curve and was voted the “fastest pitcher in the PCL” that season. In 1940, Emil pitched eight games for Los Angeles and spent the remainder of the season with Tulsa in the Texas League, where he had an 11-15 record. During that year he had two future major leaguers, Virgil Trucks and Loy Hanning, pitch no-hitters against him. Emil again started the year with Los Angeles in 1941, and then returned to Tulsa where he posted a 14-13 record in 33 games. It was good enough for him to be called up to the Cubs in September and he made his major league debut against the Cardinals at Sportsman’s Park in St Louis on September 21, 1941. He pitched two innings, giving up two hits and one run in the 7-0 loss. The starter in that game was Vern Olsen who was to become one of Emil’s closest friends. In March 1942, Emil was classified 3-A in the military draft because of a “family dependency” and opened the season with the Cubs. He appeared in one game in late April before being sent to Milwaukee of the American Association, where he compiled a 9-12 record in 45 games. During the 1942 season, Emil and catcher, Bob Scheffing, went to Lambert Field in St Louis, where they enlisted in the US Navy. Cubs’ catcher, Clyde McCullough, was already serving at Lambert Field and he helped get the new recruits on to the baseball team. Emil was assigned to the gymnasium as an instructor and pitched for the Lambert Field Navy Wings in 1943, 1944 and 1945. On April 30, 1943, Emil defeated the Cincinnati Reds, 3-2, in an exhibition game. Then, on August 2, he beat Kirby Higbe and the Brooklyn Dodgers, 6-2, in a game that had to be called in the seventh inning when Navy Wings’ first baseman Al Fisher was struck in the head by a Higbe fastball. In 1947, Emil was 8-3 and continued to be one of the most effective relief pitchers in the majors before arm trouble and an operation began to hamper his career. He was 1-4 with a 4.38 ERA in 1948, and in 1949, his last season in the major leagues, he finished 3-3 with a 3.78 ERA. The next two seasons he pitched in the minors with Los Angeles and Milwaukee, before hanging up his spikes in 1951. Considered something of a jinxed pitcher, Emil often spoke of a 1948 incident. With the Cubs leading by two runs in the ninth with two out and two on, his centerfielder knocked himself cold crashing into the wall pursuing a fly ball. Before another outfielder recovered the ball, the batter circled the bases for a game-winning homer. On November 26, 1969, Emil Kush, 53, was found dead from carbon monoxide poisoning in the garage behind his home. He is buried in St. Joseph Cemetery in River Grove, Illinois. Thanks to Raymond D Kush for information and the illustration contained in this biography. Copyright © 2007 Gary Bedingfield (Baseball in Wartime). All Rights Reserved.